Spin your wheels over slick sprawl streets while drifting away from hot pursuit. Fly through narrow canyons ahead of missiles twisting their way after you. Shrink down to insect size to get an eye on places outsiders aren't supposed to see. These are just some of the ways riggers jack up their seemingly unending adrenaline rush, as they show that the hardest shadowrunners to hit are the ones that stay in motion. Rigger 5.0 is the ultimate hot-rod, jet plane, speedboat, and more companion for Shadowrun. With dozens of new vehicles and drones, more detailed rules for vehicle chase and combat, and customisation rules, this is a book that every rigger needs to get ahead of the competition and stay there. Get the feel of laying down hot rubber in the cold shadows of the Sixth World and a taste for speed, danger, and a good, clean getaway. 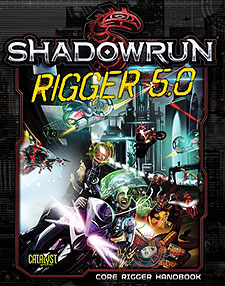 Rigger 5.0 is for use with Shadowrun, Fifth Edition.